With another successful Soyuz launch performed to expand the Galileo satellite navigation system, Arianespace today reaffirmed the company’s important role in supporting European governments and institutions with independent, reliable and available access to space. Carried out from the purpose-built ELS launch complex at Europe’s Spaceport, Soyuz completed a nearly 3-hour, 48-minute mission. It placed the Galileo passengers into a targeted circular orbit at an altitude of 23,522 km., inclined 57.394 degrees to the equator. Total payload lift performance was estimated at 1,599 kg. Soyuz Flight VS15 was performed from the ELS launch zone at Europe’s Spaceport in French Guiana. The flight had an early morning liftoff from the Spaceport – coming at precisely 5:48:43 a.m. French Guiana time. 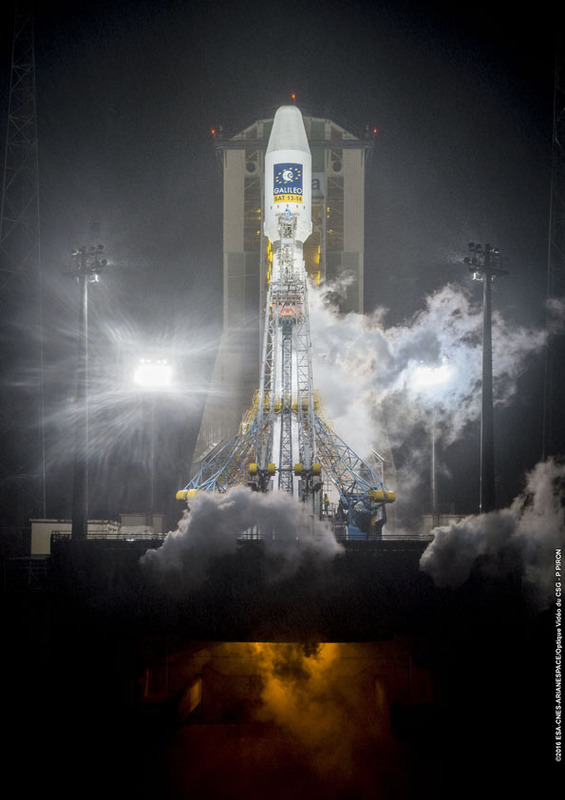 This Arianespace Soyuz mission was performed at the service of the European Commission, which is managing the Galileo program’s ongoing FOC (Full Operational Capability) phase. Design and procurement agent responsibilities have been delegated to the European Space Agency (ESA) on the Commission’s behalf. It is during the FOC phase that the Galileo network’s complete operational and ground infrastructure will be deployed. Today’s Soyuz mission – designated Flight VS15 – was Arianespace’s fifth overall carrying FOC spacecraft in sets of two. It follows one launch in 2014 (VS09), then three performed last year (VS11, VS12 and VS13). The medium-lift workhorse also lofted a total of four satellites in the program’s IOV (In-Orbit Validation) phase in 2011 and 2012. In his post-launch comments, Arianespace Chairman & CEO Stéphane Israël paid tribute to the European Commission and ESA, and underscored the continued success between these three organizations. The satellites orbited today – named “Danielė” and “Alizée” after winners of a European Commission-organized painting competition for children – are the 13th and 14th Galileo spacecraft overall to be orbited by Arianespace. They will soon join their “teammates” in the constellation to provide Galileo’s initial services, marking another milestone in providing Europe with full autonomy in the field of global positioning, navigation and timing. At full capability, the Galileo program will provide a European-operated navigation system to deliver highly accurate global positioning services through a satellite constellation in medium-Earth orbit, along with its associated ground infrastructure. The spacecraft’s onboard payloads were supplied by UK-based Surrey Satellite Technology Limited (SSTL) – a company 99-percent owned by Airbus Defence and Space, which is an Arianespace shareholder, as well. Israël acknowledged others that contributed to this latest Arianespace success, including State Space Corporation Roscomos and Russia’s industrial partners involved in the production and operation of Soyuz; along with the European support companies; the French CNES space agency; the ground contractors in French Guiana and Arianespace’s own teams. Arianespace will conduct another launch for Galileo’s FOC phase later in 2016 – this time using an Ariane 5 and its heavy-lift capability to orbit a four-satellite payload. Two additional launches of the heavy-lift workhorse in 2017-2018 will bring total Galileo deployments to 26 spacecraft. The company’s next flight from French Guiana will be a dual-passenger Ariane 5 mission scheduled for June 8, which is to orbit the BRIsat and EchoStar 18 spacecraft.